Experience has shown me that the theory which I have been trying to set forth is one which people are very apt to misunderstand, and, as misunderstood, it becomes absurd. I will therefore recapitulate its main points in the hope that by means of new wording they may become less obscure. First: the world is composed of events, not of things with changing states, or rather, everything that we have a right to say about the world can be said on the assumption that there are only events and not things. Things, as opposed to events, are an unnecessary hypothesis. 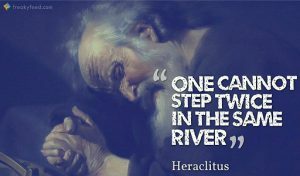 This part of what I have to say is not exactly new, since it was said by Heraclitus. His view, however, annoyed Plato and has therefore ever since been considered not quite gentlemanly. In these democratic days this consideration need not frighten us. Two kinds of supposed entities are dissolved if we adopt the view of Heraclitus: on the one hand, persons, and on the other hand, material objects. Grammar suggests that you and I are more or less permanent entities with changing states, but the permanent entities are unnecessary, and the changing states suffice for saying all that we know on the matter. Exactly the same sort of thing applies to physical objects. If you go into a shop and buy a loaf of bread, you think that you have bought a “thing” which you can bring home with you. What you have in fact bought is a series of occurrences linked together by certain causal laws.